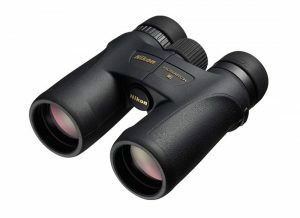 In this guide, we will share some best binoculars for deer hunting with detailed reviews. Well as exciting as deer hunting can become, most hunters will agree that it can get really frustrating when you don’t have the right gear. With the best binoculars, you can easily spot the deer whether you are hunting out in the open field or in the thick of the forest. In this post, we show you 5 of the best options that will help you catch that deer. 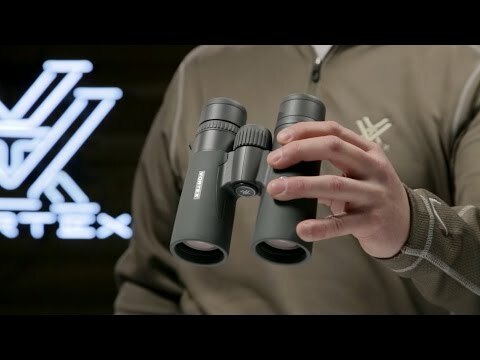 What is the Best Binocular For Deer Hunting in 2018? 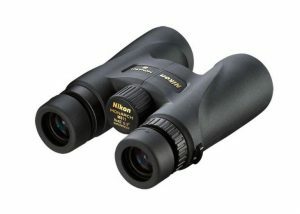 Nikon 7548 MONARCH 7 17.1mm/ 5.3mm Multilayer 8x42 Waterproof/Fogproof 5.7 x 5.1 x 1.65 in 1.3 lbs Check price! Vortex Optics RZB-2102 Razor HD 16.5mm/ 4.2mm Fully multi-coated 10X42 Ultra-hard ArmorTek lens coatings / Waterproof, fog proof, and shockproof 8 x 9.5 x 4.2 in 24.8 oz Check price! Nikon 7576 MONARCH 5 19.5mm/ 5.25mm Fully multi-coated 8X42 Waterproof/Fogproof 5.7 x 5.1 x 2.4 in 1.3 lbs Check price! Swarovski 8.5x42 EL 20 mm/ 4.9mm Coating 8.5x42 Waterproof/Fogproof 15 x 11 x 7 in 5 pounds Check price! 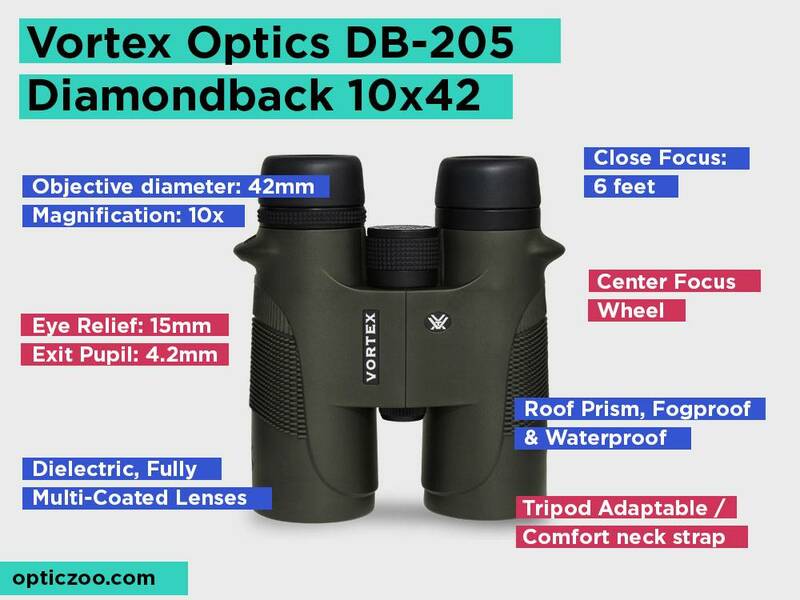 Vortex Optics DB-205 Diamondback 15 mm/ 4.2 mm Fully multi-coated 10x42 Waterproof/Fogproof 5.8 x 0.1 x 5.1 in 1.34 lbs Check price! 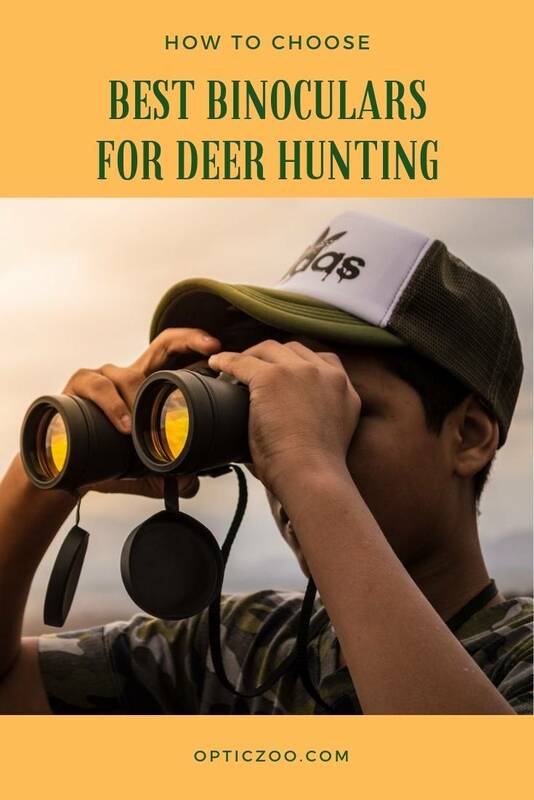 If you want to have the best chance at catching deer in the open fields, the binocular you should go for needs to give you a wide field of view. Well, that is exactly what the Nikon 7548 MONARCH 7 8×42 is built for. This binocular comes with an exceptionally wide field of view that makes it easy to spot your deer. Thanks to a multilayer prism coating not to mention a dielectric high refractive glass material, this binocular is capable of high contrast images with accurate color renditions thanks to a high light transmission level. Basically, you should expect extra low levels of image dispersion thanks to the specialized glass used to make the lenses and the prisms. In terms of body quality, the Nikon 7548 MONARCH 7 8×42 features a rubber armored coating that makes it capable of handling extreme conditions. Furthermore, the rubber armor also adds to the comfortable grip that the binocular comes with. Going by the user reviews about the Nikon 7548 MONARCH 7 8×42 from Nikon, it is clear that this binocular is a favorite for many hunting enthusiasts thanks to its accurate color production. 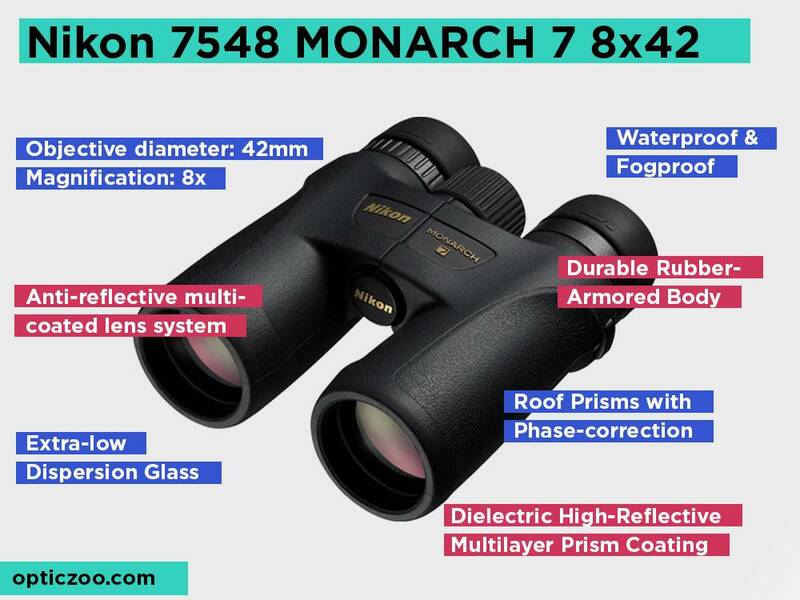 In fact, the Nikon 7548 MONARCH 7 8×42 is loved even by birders who admit its dielectric prism that boasts of high refraction levels works well to render top quality viewing in the wild. This here is a durable pick as it comes with a nitrogen-filled housing that keeps it waterproof and fog proof which is great. You also get a lifetime warranty with this binocular which is an advantage that is hard to beat. 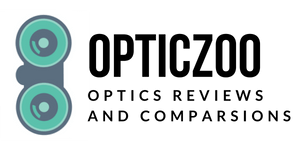 In the world of optics, Vortex Optics is one of the up and coming manufactures that is creating a lot of waves in the industry with their top of the line optical equipment. It has been over a decade since the company was founded and with its products, it is quite clear that their aim is for the top. 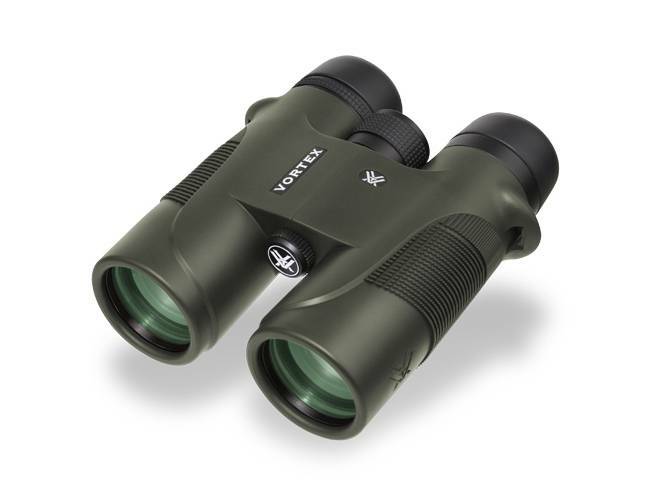 The Vortex Optics RZB-2102 Razor HD 10×42 is a clear contender especially with its eyecups that adjust to multiple positions to enable a comfortable viewing position with or without glasses. This binocular is made with state of the art lens coating that delivers the best level of light transmission for bright and clear images with high contrast. You can expect it to also work well in low light conditions thanks to the use of plasma the tech application that guarantees high levels of image brightness. Basically, you get a premium level of optics performance 10 x magnifications and a 42 mm objective lens that works well for deer hunting. 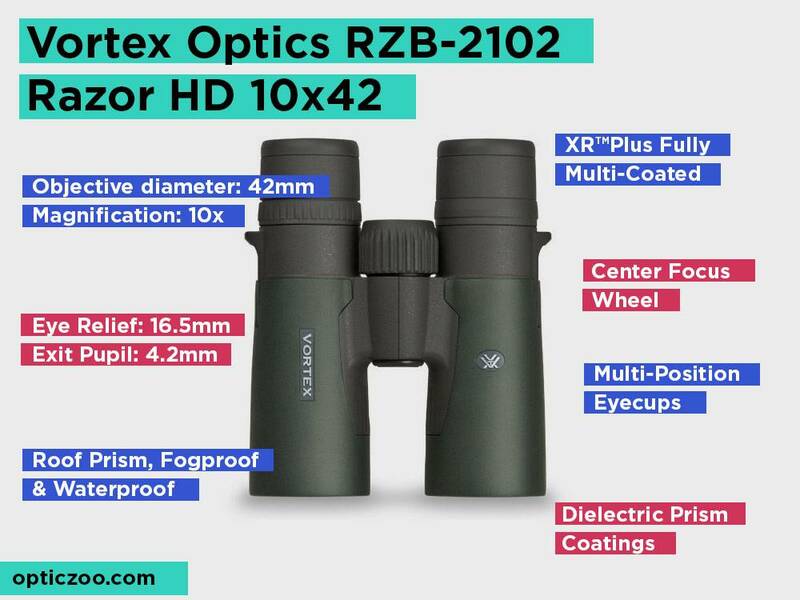 In terms of body quality, the Vortex Optics RZB-2102 Razor HD 10×42 features an argon purging design that is sealed with an O-ring for water and fog proof capabilities. The body is also quite durable as it is scratch resistant thus ensuring usage over a long time. At its price range, this binocular seems like an absurd choice. However, it is binocular that brings about top-notch optics performance for deer hunters. You basically get the best quality prism and lens quality. Plus, it has a locking diopter, an amply sized eye relief and a linear field of view that makes it easy to identify your deer from a 6.9-degree angular field of view. If you need a binocular that will help you hunt deer in low light conditions, the Nikon 7576 MONARCH 5 8×42 makes a solid pick. First of all, it’s built for portability with a sleek and compact body that is easy to grip and carry along thanks to a lightweight construction. Apart from offering an anti-slip grip, the rubber armor also brings about a durable construction that is able to withstand extreme use. 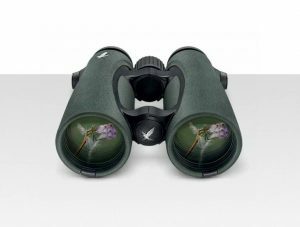 This binocular goes a mile further in terms of features to include a central focus knob that is intuitive enough even for first-time users to use when there is a need to focus on a subject. In harsh weather, the Nikon 7576 MONARCH 5 8×42 features an o-ring seal with nitrogen filled design that keeps it fog and waterproof. 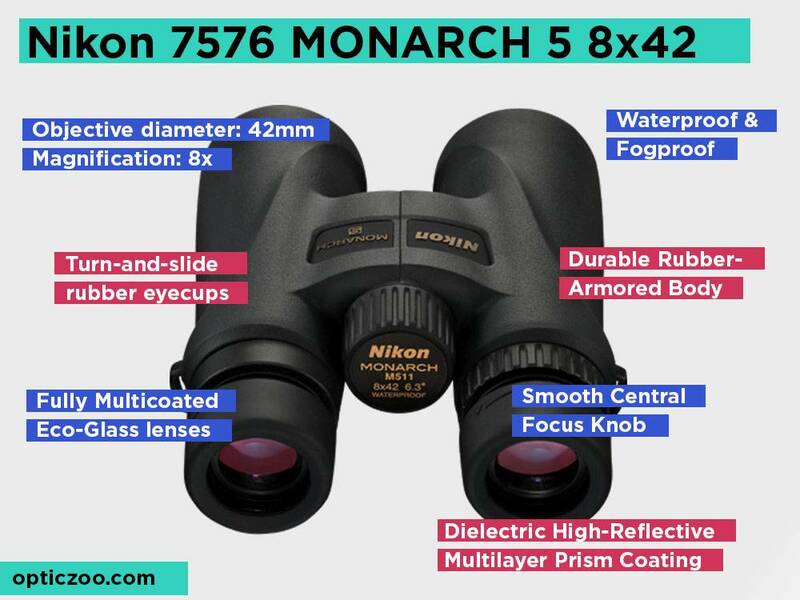 In terms of optics, the Nikon 7576 MONARCH 5 8×42 boasts of a comfortable viewing, rich accurate color rendition and an intuitive design built to impress. It’s a fully multi-coating Eco-glass pair of lenses that deliver high levels of light transmission to help you get the trophy dear even in low light conditions. From the user reviews, it is clear that the Nikon 7576 MONARCH 5 8×42 brings about the best in terms of optics performance in low light conditions. It also comes with a high eyepoint design not to mention an eye relief long enough to accommodate eyeglass wearers. You can expect high contrast images with accurate color displays thanks to its Eco-glass lenses that deliver extra-low dispersion and has a high level of light transmission. Although there are some complaints about the loosely fitting eyecups, this is actually a micro-engineering decision by Nikon in an effort to come up with an attachment to the strap that naturally covers the eye lenses when you drop the binocular. If don’t want to use it like that, you can easily slip the right side off or simply forego putting it on. 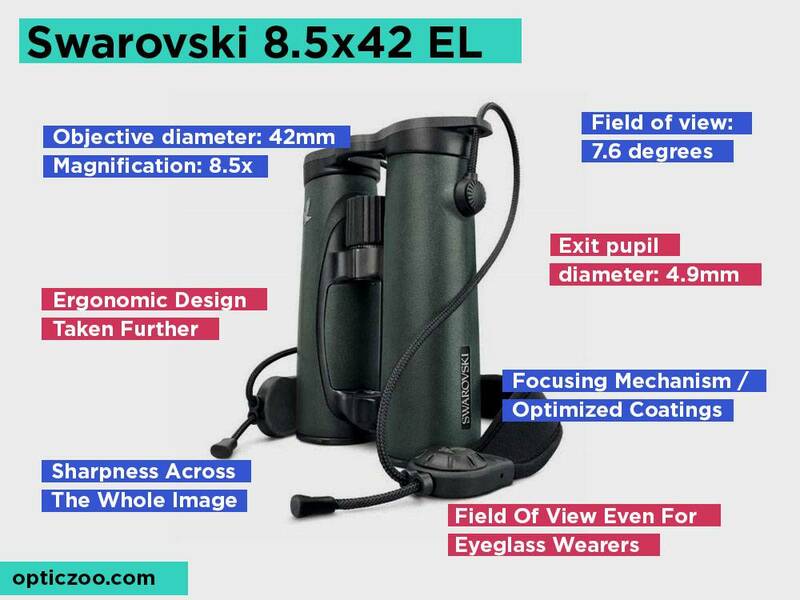 For a more stable body design the Swarovski 8.5×42 EL features an open bridge housing that keeps the binocular easy to handle while out in the field hunting. Besides, Swarovski has been in the business of making leading glass optics since it’s founding in 1895 and therefore you can trust that their experience in the making of quality optics is unrivaled. With the Swarovski 8.5×42 EL, you get field flattener lenses that achieve top-tier image sharpness bringing out the smaller details in every image. The HD lenses provide minimal color fringing while enhancing color accuracy and fidelity for your viewing comfort. It brings about a wide and large field of view with an edge to edge sharpness that works well for catching deer while out in the field. In fact, its supreme viewing has proven to work well with eyeglass wearers and its focusing mechanism is anything but sophisticated. It features a user-friendly focusing wheel that enables you to achieve the precise focus. When it’s all said and done, all that matter is the performance that this binocular is capable of. The Swarovski 8.5×42 EL is top in its class when it comes to durable and comfortable housing and overall build quality. It offers a wrap-around grip that is comfortable in the hands while out in the field. The focusing mechanism is easy to use and the entire design even comes with a set of eyepiece covers that keep the lenses protected. 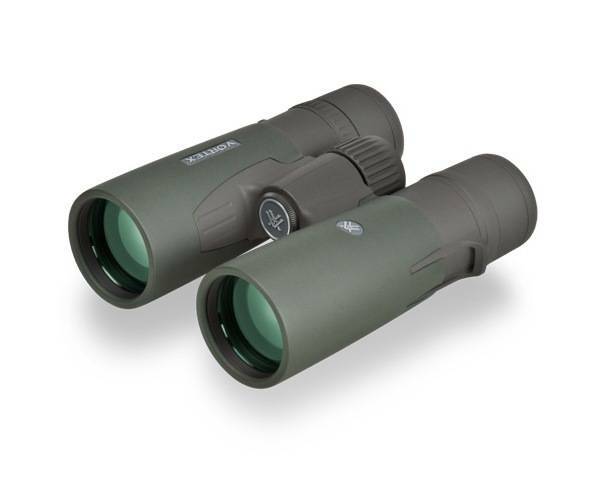 Compared to its predecessor the Diamondback D248, the Vortex Optics DB-205 Diamondback 10×42 brings about a lighter binocular with improved lens coating and a wider field of views that a lot of deer hunters will love. This binocular is one of the few affordable hunting options you will find that do not compromise on quality optics performance. It comes with a fully-multi-coated lens that enables increased light transmission for brighter images with high contrast. It also has phase correction that works well to increase image resolutions while 10x magnification capacity and a large field of view work together to enable viewing of a distant deer in the thick of the forest. The eyecups are easily adjustable to enable you to set the right eye relief for comfortable viewing at multiple positions. In terms of durability, this binocular comes with an argon purging design that keeps it water and fog proof. The entire body is coated with a rubber armor to enhance durability while improving its performance in extreme conditions. With a field of view of 362 feet/1000yards, there is no doubt that the Vortex Optics DB-205 Diamondback 10×42 is a good budget binocular for hunting deer. It also brings to the table premium quality optics performance which is rare to come by with other rivals at its price range. The eye relief is long enough even for glass wearers’ ant the fact that the eyecups are adjustable for multiple viewing positions is great. Different hunters have different needs but the one thing that connects them together is the need for optics that perform as expected while out in the field or the forest. With the right binoculars, you can get a competitive edge over other hunters and get that trophy deer you have always wanted. This guide will help you pick the binocular you need. Camouflage is an ancient tactic used by predators countless times. 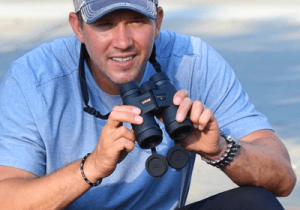 If you are planning to win in the wild, you better play by the rules that run the wilderness, so how about focusing on a binocular that will easily camouflage into the background? Furthermore, deers can be quite easy to startle and a little inconsistency in their environment triggers them to flee fast. With a camouflage binocular you can pretty much avoid this as the dear will have a hard time finding your location. 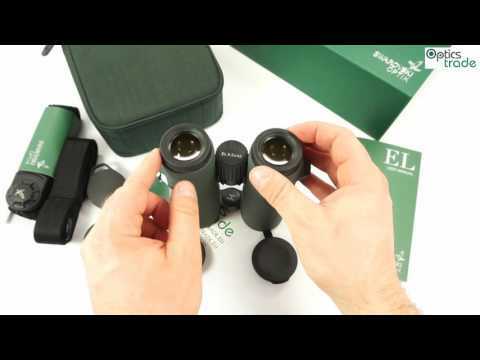 You want to have a lightweight binocular that is also easy to use. Since you might need to move around to get a perfect position for viewing your subject, the last thing you want is a bulky binocular that gets in the way. Plus look for a binocular with a user- friendly and smooth focus knob. Here you get what you pay for. The good news is that nowadays, most manufacturers strive to not only include a warranty for all their products but also to enhance the build quality of their binoculars by adding features such as an o-ring seal for water and for protection. Some even come with a rubber armor that enhances the durability of the binocular. Next, you need to think about the magnification and objective lens diameter of your binocular. By now you must have noticed that every model comes with a set of numbers such as this, 10x 42, or 8x 50. The first number in the equation represents the magnification capacity of the binocular while the second number refers to the objective lens diameter. Although a higher magnification might translate to your image having degraded focus and sharpness, it is an important feature for locating a dear hidden away by thick forest growth. With a large objective lens, you get to view a brighter image which is also a plus. The exit pupil refers to the diameter of the light that hits your pupil when you look through the eyepiece of the binocular. Ideally, for an image to appear large and clear, you need this value to be larger than that of your pupil. You can use this feature to determine whether a binocular will be capable of handling the job. Avoid smaller exit pupils below 3mm as you might end up with a view similar to peeping through a hole. The exit pupil is measured in millimeters and can be determined by dividing the objective lens by the magnification. The eye relief is the distance between the eye and the eyepiece. This is an important feature for glass wearer as it determines the comfortable experience of viewing with glasses on. Some binoculars come with adjustable twist-up eyecups to help you position your eyes at the right viewing distance. Another important feature that directly affects the performance of the binocular you pick is the prism system. For a binocular to work as expected, the inner prism mechanism needs to correct the image orientation to put the image in the right side up and enhance its magnification and contrast. As a result, there are two commonly used prism systems. Binoculars with a Porro prism system have the eyepiece offset from the lens tube. This prism system produces more bulky options. Unlike the Porro prism system where the glass elements are positioned at an angle from each other, the Roof prism system has the glass elements in line with one another thus enabling a streamlined shape of the binocular. For this reason, most roof prism binoculars are considered more expensive than their Porro prism counterparts. The type of coating your lens and prism has also contributed to the level of image clarity and contrast you will receive with your binocular. To put it simply, lens coating is the addition of an anti-reflective layer to the surfaces of the lens in order to reduce reflection of light and thus allows it to get through to the eyepiece with the least distortion. That way, the image becomes brighter and sharper. There are three levels to lens coating, they include: coating of, multi-coating, fully multi-coating. The next level is a multi-coated design. As the name suggests, this one provides your binoculars with anti-reflective coating on multiple surfaces. This level is one of the most popular lens coating mechanisms and it enables improved light transmission especially when compared to the coating level. For a fully multi-coated lens, you should expect light transmission above 90 percent which is nothing to sneeze at. A fully multi-coated lens provides top-tier image clarity, with image contrast that delivers accurate colors resolutions as well. It is a common feature among premium binoculars. Apart from the level of the lens coating, another important factor that you should consider while picking the best binocular for hunting deer is the type of glass used to make the lens and the prisms. If the binoculars lenses are made out of generic optical glass, there is a good chance light will bend awkwardly and colors will get skewed. The last thing you want is a binocular that just can’t focus or achieve a low level of image dispersion for clear and color accurate viewing. That is why a specialized glass is important for a binocular to perform well. With a specialized glass, light falls on a polished surface and travels through a glass with low dispersion, therefore, it travels without odd bends resulting in clear, sharp true color images. These are some of the materials most manufacturers use to come up with specialized glasses for their lenses. Also known as Barium Crown glass, BAK4 is one of the best quality optics glasses you will find out there. The reason is that it delivers a low critical angle and a high refractive index which translates to a better light transmission with limited light being lost in the internal reflections of the glass. This is the second best and the most used glass material for creating optics for binoculars. Although it is capable of a reliable amount of light transmission, it is much slower than BaK4. However, if you are looking for entry-level binoculars, this here is acceptable as you learn to operate and appreciate other features. As an attempt to strike a balance between the BK7 and the BAK4, the SK15 glass offers a high refractive index that is not as good as the BAK4 but just slightly better than the BK7. However, even though it’s not common, it is still capable of producing clear high contrast images. While deer hunting, the basic accessories that come with a binocular can come in handy. You might need to cover the eyepiece, a neck strap to make it easy to carry or even a tripod mount to help with support. Here are a couple of accessories that can enable more convenience with your binocular. If you are going for a higher magnification power, you will need steady hands to achieve image focus while deer hunting. However, sometimes it takes hours for a buck or a deer to stroll into your field of view and as a result, your hands can get tired holding up the binocular. This is why you need a tripod adapter with your binocular. You need to keep your optics clean and well maintained. After all, you might need to wipe off some dirt or moisture from the lens. 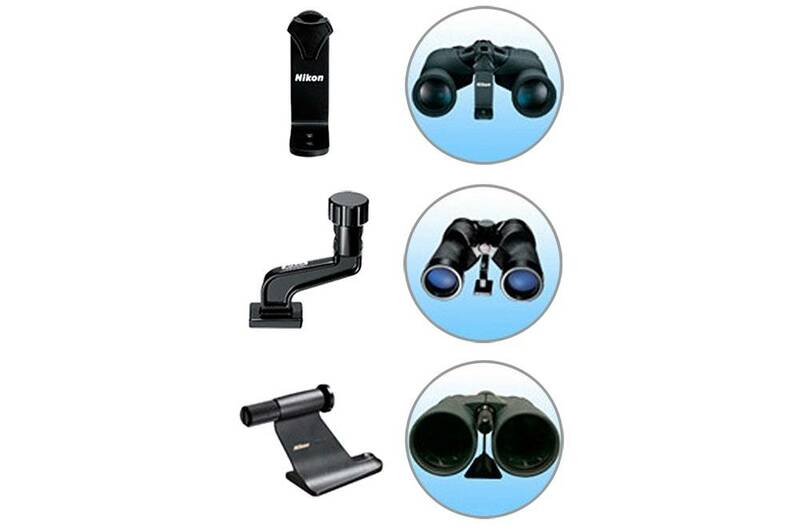 These can be a good addition for any kind of binocular and for any kind of situation. Get adjustable, padded straps for comfort as well. With a Rain Guard piece, you can easily replace the eyepiece with a single piece that prevents the eyecups from flooding during flash showers. Deer hunting is an exciting adventure that most hunting enthusiasts love. However, to make the best out of the experience, having a powerful binocular does not only put you ahead but also makes the work much easier. With our list of the best 5 options out there, you can be sure to get what you need for capturing your trophy hunt. Also, check out our buyers guide for more details.